It’s no secret that the rise in popularity of online shopping has left brick-and-mortar retailers wondering what their next move should be. Gone are the days when strict square footage formulas and standard floorplates created successful retail environments. Today, getting people to show up to shop in person requires something more: an experience they enjoy and want to repeat. Even large retail centers across the country are taking a more experiential approach to design, incorporating boutique shopping and dining experiences, large community event spaces, and retail integration with the natural environment and live entertainment. Now more than ever, architects and designers are called upon to design new, contextual, and personal experiences for traditional retail locations, with much more emphasis on true placemaking techniques. The good news for retailers is that there are still plenty of experiences that draw people out to new destinations, even if their first stop is outside the store. When planning a new location, we often start brainstorming the kinds of experiences people of all ages could have throughout the day. What does a 6-year-old do there that she’ll want to do again and again? How about teenagers (yes, teenagers)? Is there an ice-skating rink or a great after-school pizza shop? What would make a first date memorable there? What are the daily routines, like morning coffee; and the annual traditions to be hosted, like a summer concert series? Once we’ve defined the experiences, we think about how the physical environment needs to be crafted to support our concept. Effective design conditions include: human scaled buildings and streetscapes, inviting sidewalks on traffic-calming streets, and places to sit or play or meet. 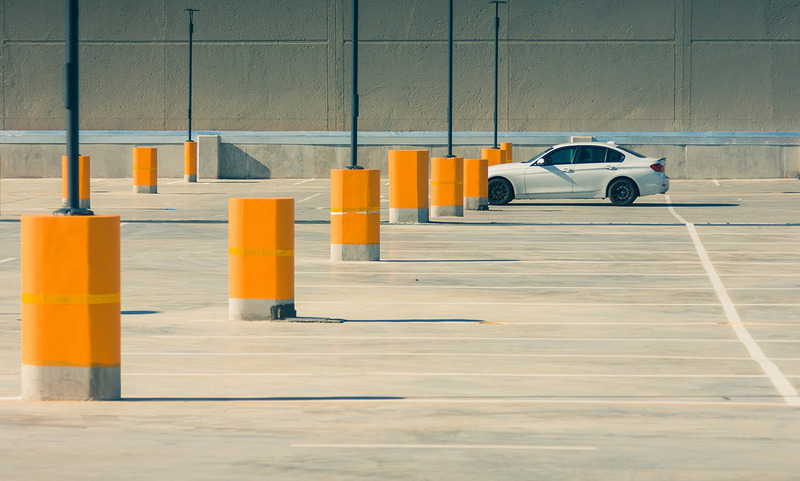 What makes a new retail district even more compelling is how it’s informed by its context. Our design should offer something unique to the surrounding neighborhood, but feel authentic with the local vibe. How can this new destination feel true to its place, but provide an experience that’s one of a kind? Recently, we designed a retail building that does just that! The Crescent Communities NoDa Retail building sits within Charlotte’s arts district, between the neighborhood’s seasoned boutique shops and new development. 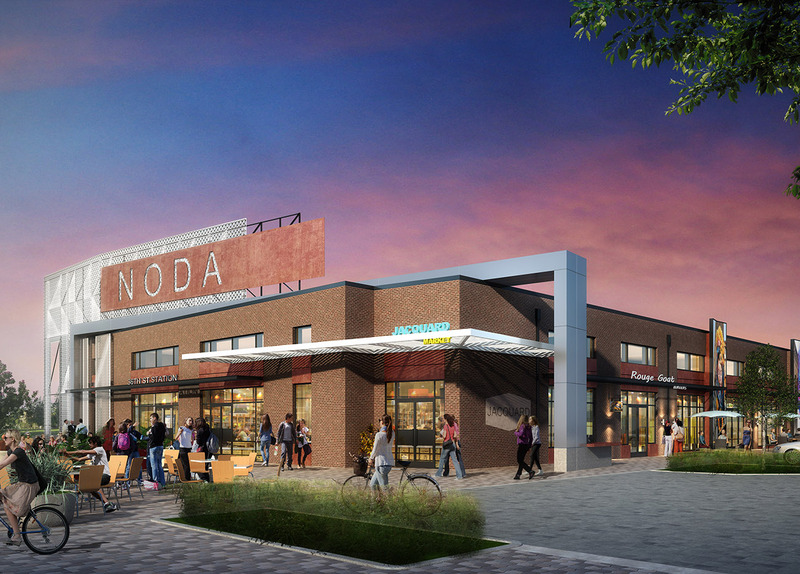 Our design combines the retail experience that NoDa shoppers already love with architecture that compliments NoDa’s newest multi-family building and Lightrail platform. The building’s design incorporates bold iconic signage for the neighborhood, public art areas to explore and share via social media, outdoor event spaces that function throughout the week, and extensive flexible store-frontage for retailers. 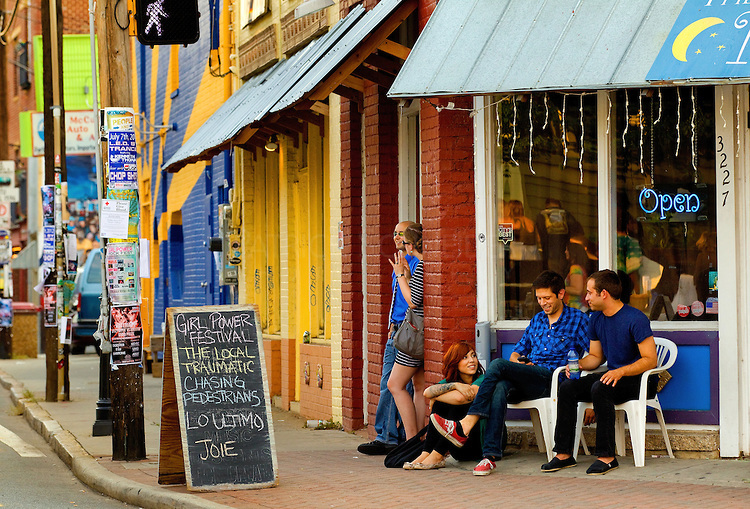 Local Charlotteans know NoDa has always been an enjoyable neighborhood that is walkable and suitable for spontaneous interactions. Our goal is to continue that great tradition, while responding appropriately as the neighborhood continues to evolve. It’s clear that walkable, mixed-use retail centers represent the future of offline shopping. As consumer expectations, desires, and needs continue to evolve, architects and designers must evolve their work as well. The first step in a retail evolution is understanding that people don’t need to leave their house to buy most “things” anymore with the prevalence of online shopping. The solution isn’t building more stores, it’s providing people with a greater experience that they want to be a part of!